This is the painting that started the "Odd Couple" series. I just happened to plop these two things down next to each other with no intention of painting them. But something made me look twice. After doing this painting, I was hooked and started walking around the house looking for things that didn't "go together" to paint. I'd like to continue that series...maybe soon. I think our best work happens when it "doesn't quite go together", when you push it to almost break a rule. I like that - and I like this series Don. 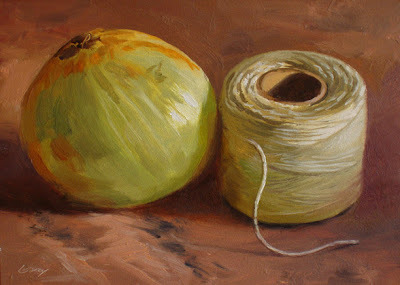 Only an artist would see a painting in an onion and a ball of string. Good eye! I like the combination. The lines and colors. Works. I sure agree, Sheila--trying to approach our work in fresh and unpredictable ways is always important. Thanks for your comment. That's OK, Micah--the whole series is based on weak humor. Don't think I can't read between the lines, Sam. What you're really saying is only an artist is that warped. Well, join the club! What a unique pairing, Don! Thanks, Dean--I've enjoyed doing this series and want to do some more "odd couples."